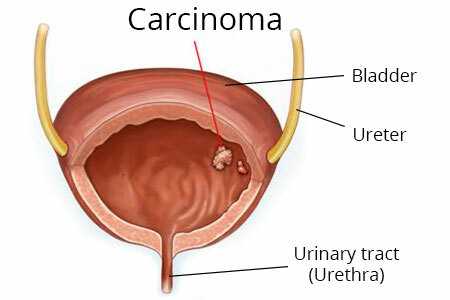 The term “bladder cancer”, often referred to as urinary bladder carcinoma, bladder carcinoma, or as so-called urothelial cell carcinoma, is understood to mean a malignant tumour of the bladder. Bladder cancer affects significantly more men than women, namely about two and a half times more. 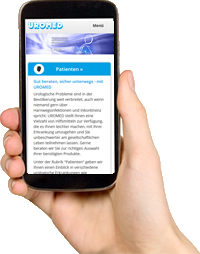 The total number of new cases of bladder cancer in Germany is about 28,700 per year. Carcinomas that are locally limited and therefore highly likely to be cured are also included in the statistics, as well as uncertain findings of cell regeneration. Bladder cancer is almost exclusively a disease associated with old age. The average age for the disease is 72 for men and 74 for women. Bladder cancer is rarely diagnosed in people under the age of 65. Bladder cancer is very rare in young and middle-aged adults. Many studies have shown an increased risk of bladder cancer in cigarette smokers. The relative risk is between 2:1 and 6:1 compared to a non-smoker. Aromatic hydrocarbons have a decisive influence on the development of cancer. Drugs and various agents, e.g. aromatic amines, can also be associated with the formation of bladder carcinomas. People working in the paint industry, rubber processing industry, coal industry, laboratories, aluminium industry, textile dyeing and textile industry, printing industry, radiation processing industry and plastics industry are also particularly vulnerable. The consumption of artificial sweeteners and coffee has also been discussed as further risk factors, in addition to previous radiation exposure and genetic factors. Patients often notice reddish to brown colouration of the urine (haematuria) first, which is caused by the bleeding of the tumour. Added to that is an increased urge to urinate and problems or pain during urination. In these cases, a specialist (urologist) should be contacted immediately. The diagnosis of bladder cancer can often be excluded after a thorough examination by the urologist since the symptoms may be due to other harmless causes. To confirm the diagnosis, a urinary bladder examination (cystoscopy) is indicated with the removal of a tissue sample. It allows the location, size and number of tumours to be documented. The same applies here as with prostate cancer: The earlier the treatment, the better the survival chances. The treatment methods depend on the stage of the tumour. The less the bladder carcinoma has infiltrated from the superficial urothelial layer into deeper layers of the bladder wall, the more favourable the prognosis for the patient. If detected early enough, the tumour cells can be removed by transurethral resection (TUR). Subsequently, chemotherapeutic agents are often introduced into the bladder via a catheter in order to prevent the cancer from returning. The »EMDA®«* method, for which UROMED has assumed exclusive distribution in Germany and Switzerland, is particularly effective for this. Drugs such as the anti-cancer drug Mitomycin can be directly inserted into the bladder wall by means of an electric field.